“Starfish” stems from Alice’s mother's death. Alice was studying Medicine at university when her mother was diagnosed with cancer. Alice, therefore, was in a unique position to care for her mother at home due to her training. The book delivers an honest, open account of caring for someone who is dying from a personal but also clinical point of view. It demonstrates just how much love for someone can hurt. Subsequently, when Alice’s mother died, she attempted suicide. Alice was admitted to a psychiatric unit and the novel follows her as she struggled to live a life without her best friend, her mother. Alice was diagnosed with depression and was transported from working in hospitals to being a patient. She found this transition hard at the beginning and could not comprehend how to live. She received much support from various clinicians and slowly began to rebuild her life. Alice Addison was born in 1984 and currently lives in Newcastle-upon-Tyne. She was diagnosed with depression in 2008 and wrote this book for others going through a similar situation. This was her first breakdown and admission to hospital. Alice originally trained as a doctor but, owing to illness, was unable to practise. She graduated with a Medical Sciences degree from Newcastle University in 2011. She has spent four years in and out of psychiatric hospitals in her twenties and this has given her insight into life as a sectioned patient. Owing to her medical studies, she was able to nurse her dying mother at home. When her mother died, this triggered her first episode of depression. Starfish is the story of this. 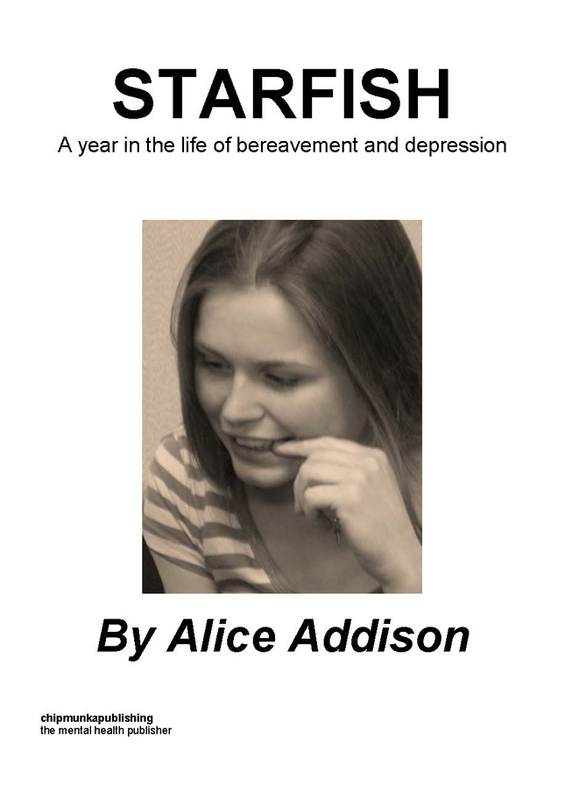 Alice wrote this book to express her problems and to describe the pain of watching a loved one die. It is about her struggle to escape the trap of institutionalisation and to get back to her primary love: practising as a doctor. I don’t want to go back to medical school. I don’t want to be a doctor. No-one understands why. In a bid to actively avoid anything medical, I seem to have encountered more than necessary. I wish that, in deciding to give up my degree, I could forget all that I have learnt. Go back to the beginning. I am asking the impossible. Too much knowledge - I didn’t think there was such a thing. Since Mum died, I feel I have been thwarted by other people’s medical problems. Do I cause these bad things to happen? Why am I always around? I want to help but feel I am fighting a losing battle. If I caused them in the first place, then anything I do after the event is negligible to allowing them to occur initially. All this I seem to forget at the time and fully engage myself, whatever the situation. Dr. Alice knows what to do in crisis time: she is calm, confident and, more importantly, competent. It is always afterwards that the nightmares begin but, herein lies the fundamental problem, I still have the knowledge accumulated over four years’ work and everyone still knows the course that I have followed, so they defer to me. How to escape? I honestly doubt whether I could inject anyone ever again and, compared to my peers, I’m probably good at it – Mum’s veins were dreadful. The thought of treating patients fills me with the fear and anxiety that leapt upon me during the night times when Mum was alive. Apart from anything else, this wouldn’t be fair on the poor, unsuspecting patients. Who wants a nervous wreck at their bedside? Patients should feel calm; doctors need to instil confidence and trust. Aside from the all-too-true clichés, I wouldn’t feel happy “helping” patients if I was adding to their unease. Would I be able to hide my own angst? Or would I crumble into an unsightly mess? People say, am I disillusioned with the NHS after Mum’s care? was it truly dreadful? was Mum not treated as well as expected? No! Even if I had to go through that all again, I would not change a thing. I would also have spent four years at medical school just to look after Mum and enable her to stay at home. If someone had told me before I started that I was doing all the training for the sole reason of looking after Mum and then, once Mum had gone, that was it, a different career, I would have said yes. More than that, I would have jumped at the chance, it being such an absolute honour to do that for my darling mother. I could care for Mum to the best of my ability because I had such compassion, such love, such drive to look after her. I used to have that towards patients, obviously not to the same extent as Mum, but it was always there. Every day in hospitals filled me with an excitement that was unmatched to anything I have known. What if that desire has vanished? What if there is nothing? I couldn’t be a good doctor if all it was to me was a job. I wouldn’t be doing my best. It wouldn’t be fair on my patients. I can’t do that to other people. It would be selfish of me to continue with something that directly influences others if my passion has disappeared. Is this the naivety of youth or obtained wisdom? Whichever, I need to decide if I have lost all of this. What if it is still there, just obscured by too much hurt? The conflicting and confusing thoughts pain my head. What do I do? I can’t focus my mind sufficiently for sensible thought. My concentration, which was always rather lacking, has now diminished to pitiful levels. I can’t be a doctor, I can’t even manage measly tasks at home without tremendous effort and then they invariably go wrong. I feel I am competing against everyone who says I shouldn’t give up medicine. I feel I need to justify my rationale. I don’t want to fight against them because my reasons sometimes don’t make logical sense to me, so explaining to others is near impossible. Then there are the ones who show insight, which makes me feel ever so sad because, even with their understanding, they still believe I should be a doctor. I spoke to Uncle Peter at length; he knows I have more understanding about his situation than most. Aunty Maggie has cancer, terminal, has been fabulous still going on holidays and making the best of each day, but now she has become more poorly. Uncle Peter says that it is so hard when Aunty Maggie is ill. He doesn’t know what to do: call an ambulance? give her more painkillers? take her to hospital? He says he feels helpless. But then he demonstrated remarkable and unselfish empathy towards me. He said it is one thing to feel helpless but it is quite worse to feel completely helpless when you should know what you are doing. He said he admired me for that. Everyone expected me to know what to do; I expected myself to know. The pressure, at times, almost felt unbearable. I did all I could. I did my absolute best. It was petrifying. I’m so scared to go near that again. And then there was Mum. My darling mother who always had exceptional confidence in my abilities, all of which she had taught me. She fostered the caring nature that she had instilled. That is why I knew I was the best person to look after her, not because I was especially wonderful, but because she had shown me how to care for her in the best possible way.